Actually, there are no hotels on the airport site, although several hotels in Malaga City and Torremolinos (both roughly 6km from the airport) operate their own shuttle services for guests. 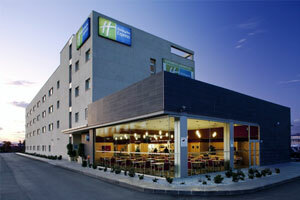 The Holiday Inn Express Malaga is the nearest hotel from Malaga Airport-Costa del Sol. 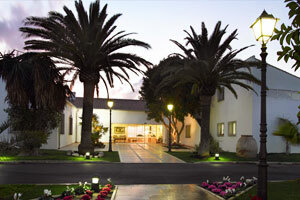 It is a functional hotel with free parking and modern rooms with satellite TV. All rooms have heating and air conditioning. The bathroom includes a bath and bidet. The continental breakfast is included in the room rate. There is also a coffee bar and a restaurant. Hotel Campanile Malaga Airport is located a 2-minute drive from Malaga Airport – Costa del Sol and 5 minutes from downtown. It offers free Wi-Fi and free parking. The Hotel offers bright, modern rooms with air conditioning, flat screen TV and desk. The restaurant offers continental breakfast and traditional English breakfast. During lunch and dinner are prepared seasonal dishes. This luxury hotel offers an authentic Andalusian style and beautiful sea views, offering a historic golf course with 18 holes, 3 golf putting green and two practice fields. The hotel has an outdoor pool and restaurant. Hotel with airport shuttle. 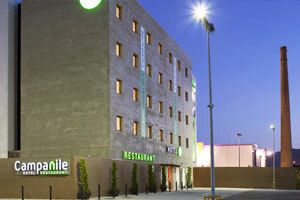 The Hotel is located in the industrial park near the A-7 motorway and a 5-minute drive from Malaga airport. It has free parking, outdoor pool, games room and free Wi-Fi in rooms. The bright, modern rooms are equipped with air conditioning, flat screen satellite TV, mini-bar and desk. All have private bathrooms with a hair-dryer and toiletries. There is a bar and restaurant. 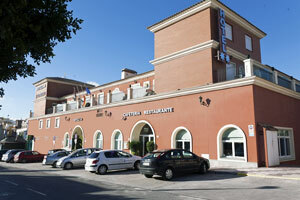 The hotel is situated 4 km from the beaches of the Costa del Sol. This cheap hotel in Malaga is the closest to the Palace of Congresses and Fairs, fairground, auditorium, university and hospital. Romerito Hotel is located in a business and industrial park. The rooms have air conditioning, Wi-Fi, plasma TV and private bathroom. Some rooms have terraces. The hotel also features a bar and a restaurant that serves a la carte and daily menus with local specialties. The nearest beach is 5 km away and Malaga airport is a 15 minute drive from El Romerito. The hotel has parking. Tryp Guadalmar is surrounded by gardens and has 2 outdoor pools for adults and children and offers air conditioning, free Wi-Fi and rooms with balcony overlooking the bay of Malaga and direct beach access. The Hotel offers a tennis court and a heated indoor pool, gym, sauna and hot tub for a fee; there are breakfast and dinner buffets. Entertainment programs and shows are organized in the evening every day. The Hotel Zen is situated just 300 meters from the suburban train station La Colina station and 4 stops from Malaga Airport. There is a bus stop at 50 meters. The beaches of the Costa del Sol are 1.5 km away. The Hotel is located in the quiet area of El Pinar in Torremolinos, offering air-conditioned rooms, private parking and free Wi-Fi, 2 terraces and an outdoor pool. The Zen Hotel rooms are set around a courtyard. All rooms have private bathroom and TV. Hotel with airport shuttle. 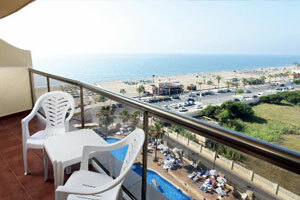 The hotel is located 10 minutes from the beaches of Torremolinos. All rooms are modern and have air conditioning, a safe and a fully equipped bathroom, Wi-Fi and plasma TV with international channels. The restaurant serves Mediterranean cuisine. Free parking available. The Hotel is located on the seafront in Torremolinos and has 3 outdoor pools, hot tub and direct beach access to Playamar. All rooms have a bathroom and satellite TV with international channels, air conditioning and balconies, most of them with sea views. The hotel has a terrace with sun loungers by the pool, a sauna, gym, mini golf and playground, a buffet restaurant and 2 bars. It offers evening entertainment and live shows. Free parking available. 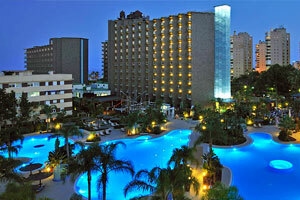 The Hotel is situated on the seafront with direct access to the beautiful beach of Playamar Torremolinos. It offers outdoor swimming in lagoon style, tropical gardens and a heated indoor pool; the rooms include a balcony with sea or pool view, small refrigerator and air conditioning. In the hotel are available a restaurant, burger, bar and coffee bar, children’s pool and play area, kids club and entertainment for all ages. 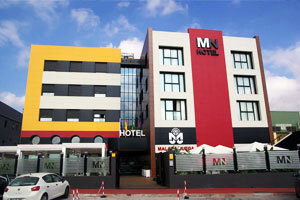 Get the best prices for any of those hotels in Malaga at MalagaHolidays.com.